Heat gas or charcoal grill. When grill is heated, place bratwurst patties on gas grill over medium heat or on charcoal grill over medium coals; cover grill. Cook 8 to 10 minutes, turning once, until patties are no longer pink in center. 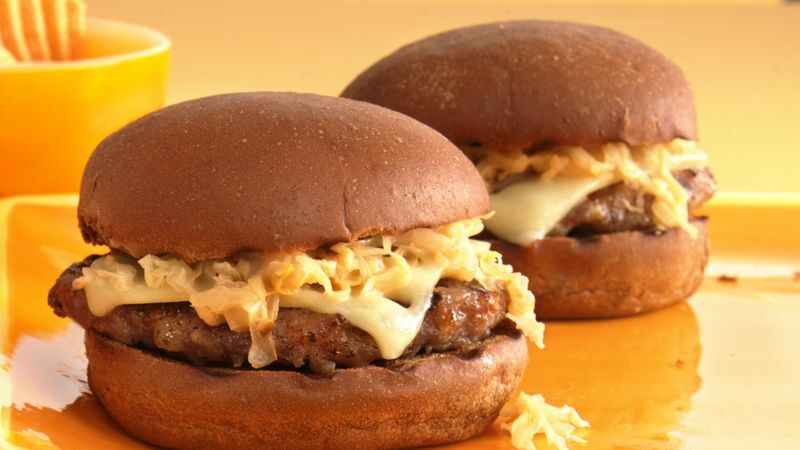 Place buns, cut sides down, on grill and top each bratwurst patty with slice of cheese; cook about 1 minute or until buns are toasted and cheese is melted. In medium microwavable bowl, microwave sauerkraut on High 1 to 2 minutes or until thoroughly heated. Stir in dressing. Top bottom half of each bun with bratwurst patty and about 1/4 cup sauerkraut mixture. Cover with top halves of buns. Serve these tasty burgers with baked beans, potato chips and dill pickles, if desired.